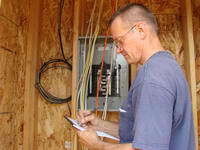 I strive to help everyone I can with great information about their home electrical wiring project. Please provide me with the following information. Thanks So Much for Your Great Electrical Questions! Please provide me with some good information about your home electrical question. If Your Question is About a specific device such as a motor, heater or air conditioner or some other type of equipment please provide the Manufacturers Name, Model Number, Volts and Amps. Most of the time this information can be found on a label attached to the device or the specification sheet. A clear picture of device and the label information would be very helpful. Be sure to include as much detailed information as you can. When you are done simply click the [Submit] button to continue to the next page. or I Cannot Send You a Reply! New Project, Previous Work Done, etc. find a photo on your computer. It's nice to get some Feedback! The "Electrical Tips Newsletter" gives you Valuable Tips about Electrical Wiring. My eBook: "Electrical Mistakes and How to Avoid Them"
Both are Free, No Obligation - Ever! Yes - I need help with my project, send me your Free Electrical Tips. What is: 17 + 13 ? I NEVER Share Your email address - I Promise! author and educator with over 38 years experience. Helping people with electrical questions... one answer at a time.